The mac are back ! At last the first shoals of our big winter spanish mackerel have arrived after a much hotter than normal autumn we are getting the tail end of cold fronts and water temps are dropping just what the mackerel need. 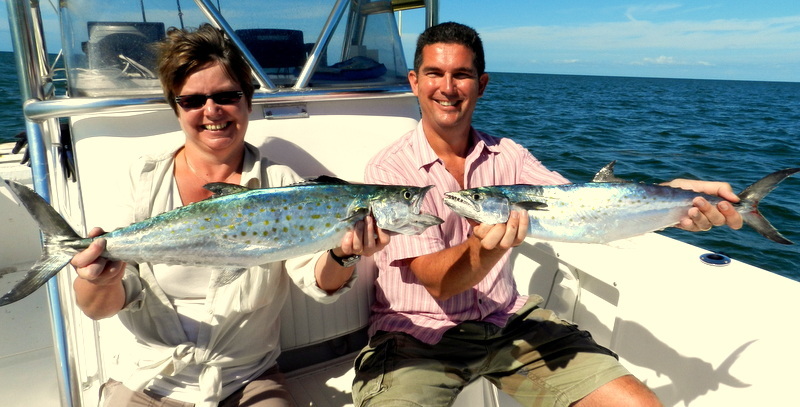 Last week I had Steve and his wife Sarah for a couple of days on a real-time look at our fishing holidays in the Florida Keys and I think they liked what they saw and are booking a longer stay for next year. Which by the way is nearly all gone as are the best weeks in 2015 so don’t dream book before it’s all gone and fish the dream. Despite the poor water in the bay the macs are back and both Steve and Sarah were having a blast on light rods with these speedsters. Very few fish hit baits as hard as a hungry mackerel the sound of the braid cutting through the water on the first 50 yard run just awesome. With the mackerel come packs of hungry shark mainly blacktip and spinner which are two different species but also the rest of the gang like a nice fresh mackerel and recently we have had tiger, lemon and bull. There are some days all the chum and oil brings massive shoals of blue fish and this year has been no exception and good 7 lb + fish which certainly pull your string like UK bass but with a sett of teeth to cut anything in half. 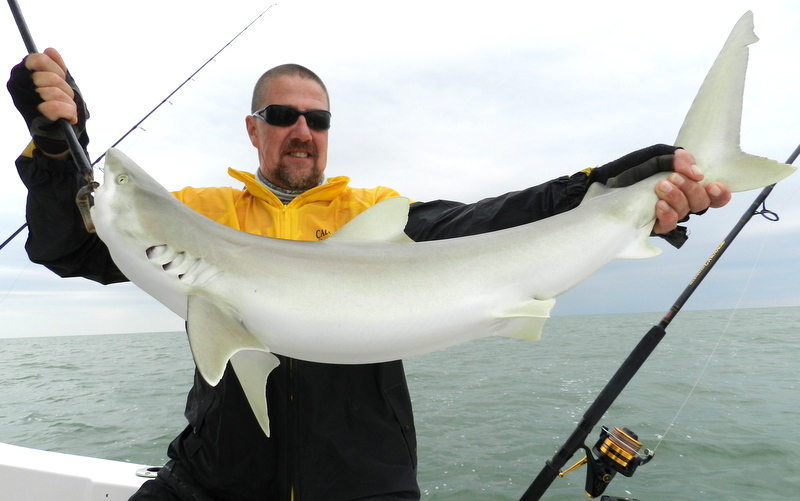 Also some days all you get is huge packs of blacknose shark a bit like your smoothhound on light tackle fun all day if you want up to 30 lb. As I have said before I would like to get into tagging and a friend has put me on to a guy tagging shark which would be fun any thing I can put back into my sport is fine by me. 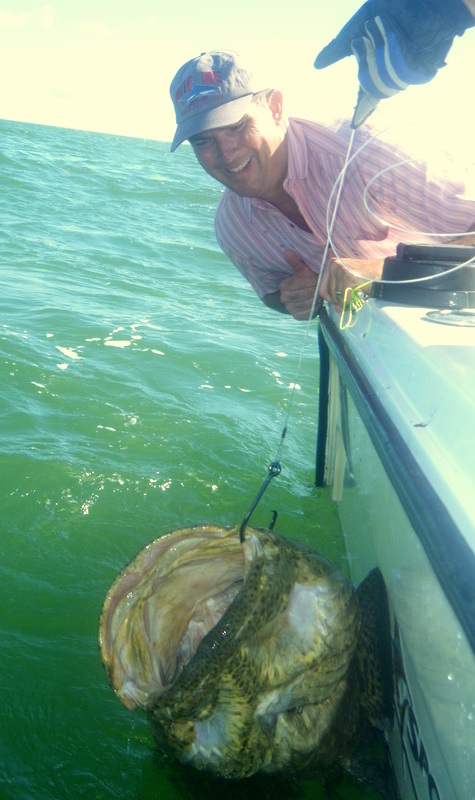 Oh did manage to scare Steve with one OMG fish thanks grouper. Comments Off on The mac are back ! 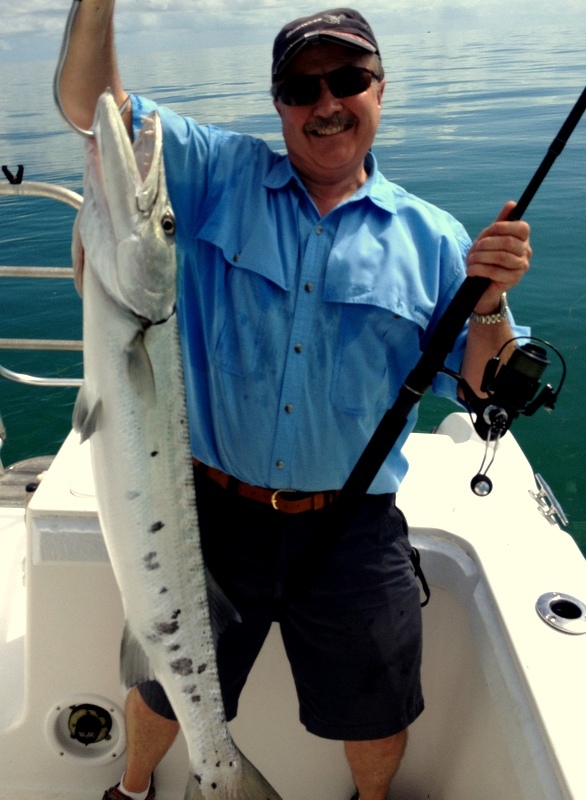 Well it seems if you are on a fishing holiday in the Florida Keys it still to some extent does. 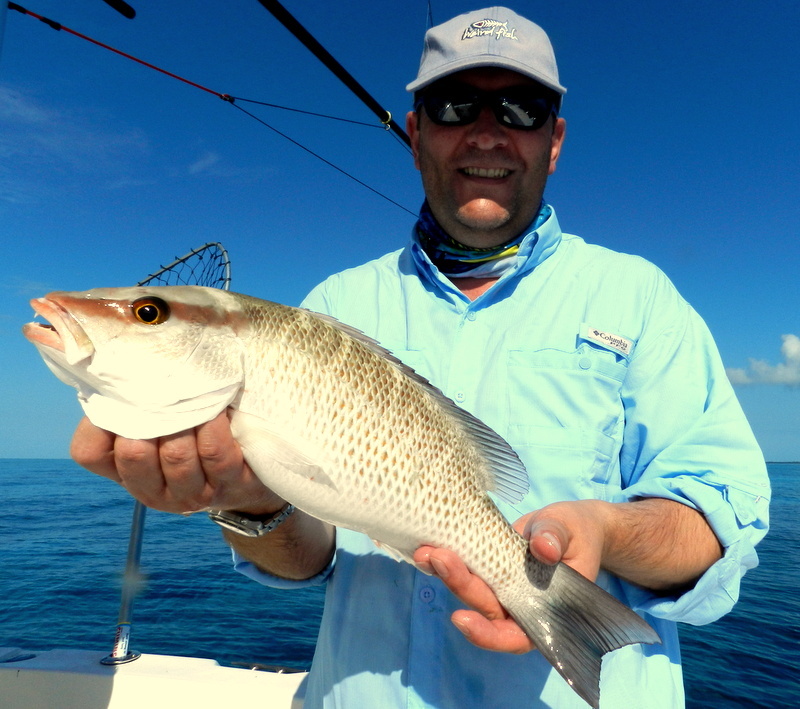 Last week it was great to have Patrick and Dave who just liked catching fish and on a crystal clear reef one day we were freelining baits to reef fish and Patrick had a couple of very hard fighting mangrove snapper. However at our planning meeting one morning I said do you guys fancy a battle with one of my goliath grouper and their eyes said it all ( oh yes ) big tends to do this. So load the boat and head north about 20 miles to one of my wrecks, the water in the bay has been on the murky side now for over a week and a lot of the wreck fish have moved off but the grouper have nowhere else to go so are always at home. 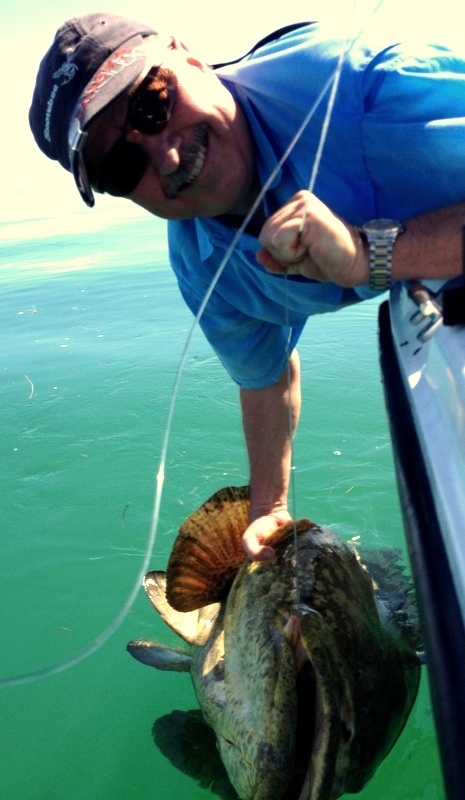 The one thing being a very big fish means is you have to eat a lot and a grouper eats up to 10 % body weight a day so a 500 lb grouper will eat up to 50 lb and they are not to picky. So scary bait down and it no time the giveaway movement of the float, drag sett to lock solid then hang on and start the Whippy walk. 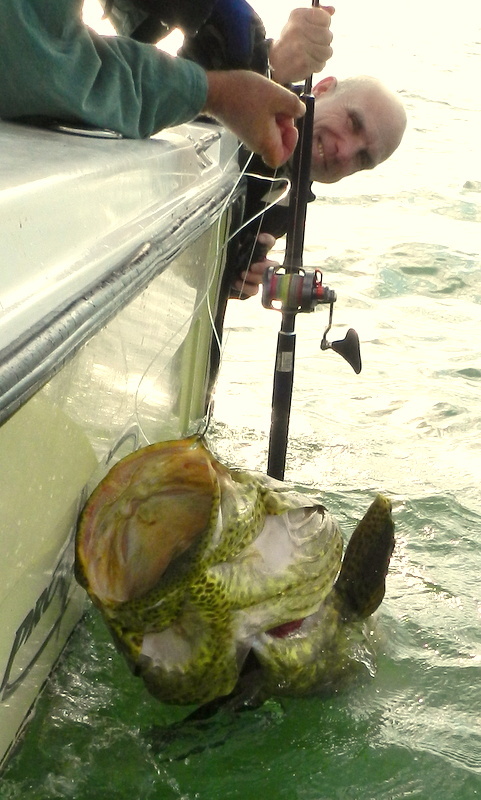 There is no way whatsoever I can get over in words on a blog the power in these fish to see two, yes two grown men dragged then slammed into the transom by a fish just awesome. What the fish had not taken into account was the determination of Patrick and there was only going to be one winner and soon the fish was boat side for the silly pics what a beast well over 300 lb. 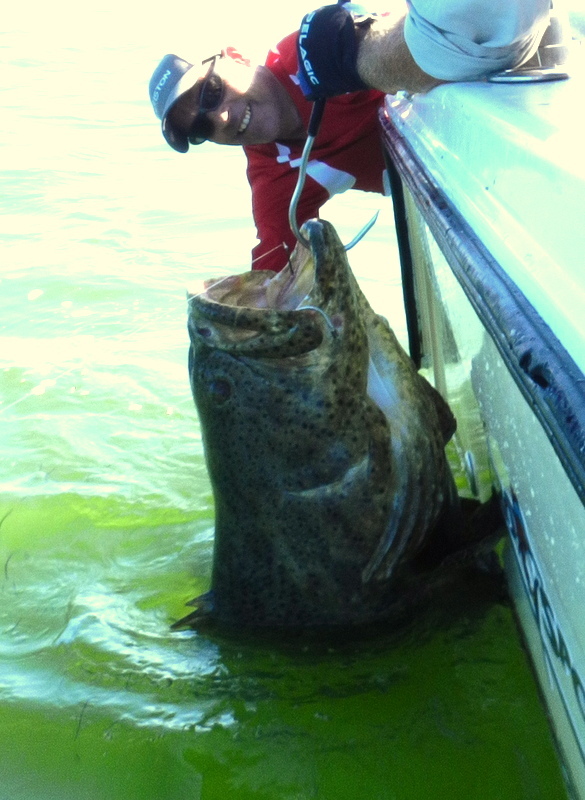 The smile on Patricks face during the high-five celebrations said it all if you are a fisherman size still matters, from a 2 lb roach, a 10 bass, a 40 lb tope to a 300 lb grouper and why not ! Comments Off on Size matters ? To say the weather this autumn has been strange is an understatement from 30 + mph to flat calm the normal cold fronts have been very weak and the water is still very warm slowing down our winter migration. It will come I am sure but a tough day out in the bay on Monday very calm seas but with big tides and the strong winds the day before very dirty water. Dave had a 150 lb + grouper on a medium ledger rod and did an excellent job to bully it out of a wreck so that box ticked but the normal wreck fish were not about so off for some sporty shark fun. 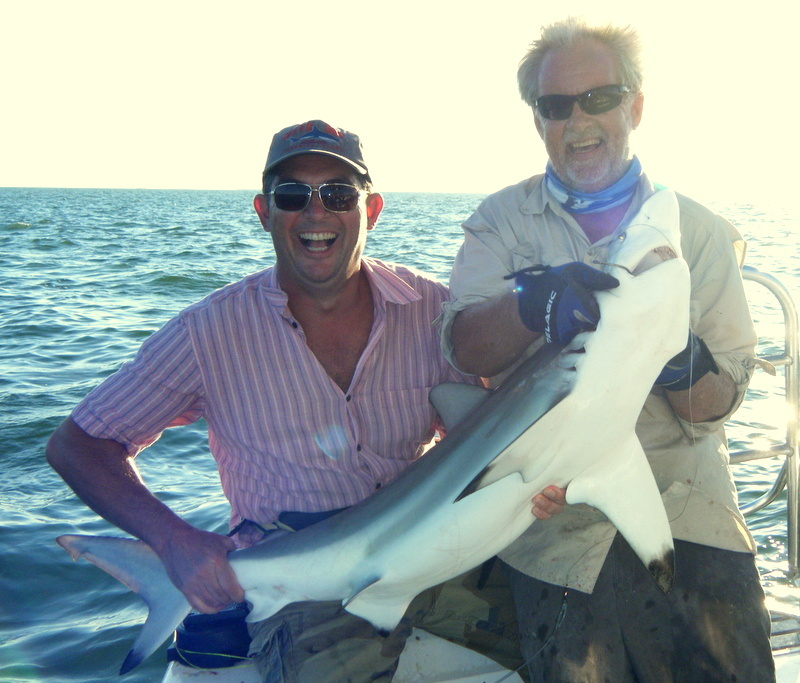 Not much puts shark off the feed and as I have said before guys on our fishing holidays in the Florida Keys just love these fish on light tackle or as my fluff chuckers say match the hatch with the catch. Yesterday the weather gods said tuna if you want and my local friends were saying that the deep wrecks were giving amberjack so loaded for bear we went south. First we had a go for sail fish but it was glassy calm and crystal clear with vis over 70 ft so not very good and after an hour trolling with no joy sett the gps for the tuna grounds with a 200 ft wreck on the way. 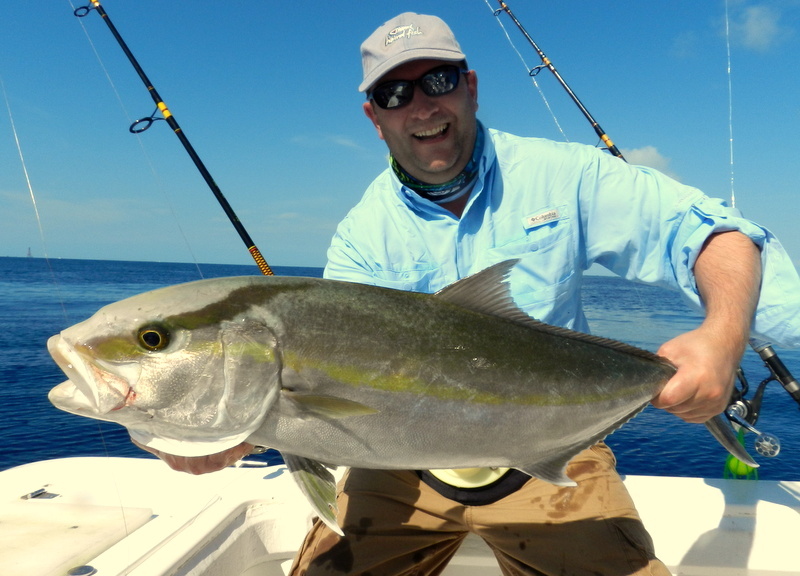 First to catch was Dave again a nice skipjack put a bend in his jigging rod then the OMG from Patrick on the bait rod ment his first encounter with an amberjack long fight but this one was won by the fish as it managed to spit the hook about half way up. Next one was well stuck and he came to understand why the locals call the fish wreck donkeys the just don’t want to move and you have to move them nearly 200 ft for that silly pic they are not good eating so all go back, Patricks fish we had to vent wish I had the venting tool years ago with the gas out they all swim away. 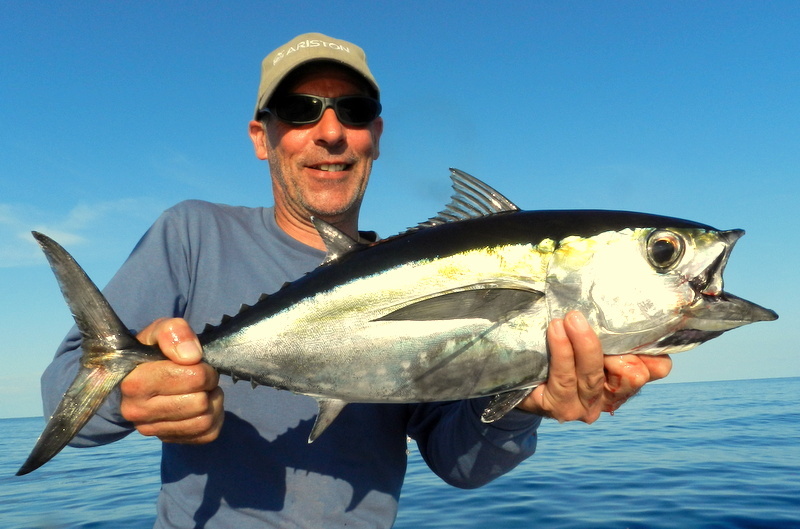 Tuna fun as they have been all year-long Snowbee’s jigs out fishing local jigs about four to one why these have not taken off in the UK for cod and pollack I don’t understand. On the way home came across a feeding frenzy of small tuna on bait fish on a patch of weed then we all saw a very big sailfish join in so a live bait was pitched into the mix, fist run no fish second bait a very solid hook up not the sail but the biggest tuna of the day for Dave. So off home with loads of fresh tuna for tea some very hot but happy anglers job done again. This weekend is all about my wife Helen putting a big smile on her face, yes she has a lot to put up with and for over 40 years has done it very well. So this weekend it is all about her ( not mine ) passions, one shopping so a long stop at a Miami Mall then a full day’s car racing at Homestead Miami Speedway. How many guys out there have a petrol head wife but Helen caught the bug many years ago when I raced cars and bikes, not very well by the way but she loved it. So this weekend as the Nascar boys and girl come south to finish off their season we will be there to hear, see and feel 43 cars averaging nearly 180 mph for the 400 mile race and Helen’s smiles will say it all. We have just had our first cold front of year when the temps dropped into the low 70’s always a shock for locals who have to find coats, hats and long trousers but it is sure nice to turn the A/C off and have some air in the house. 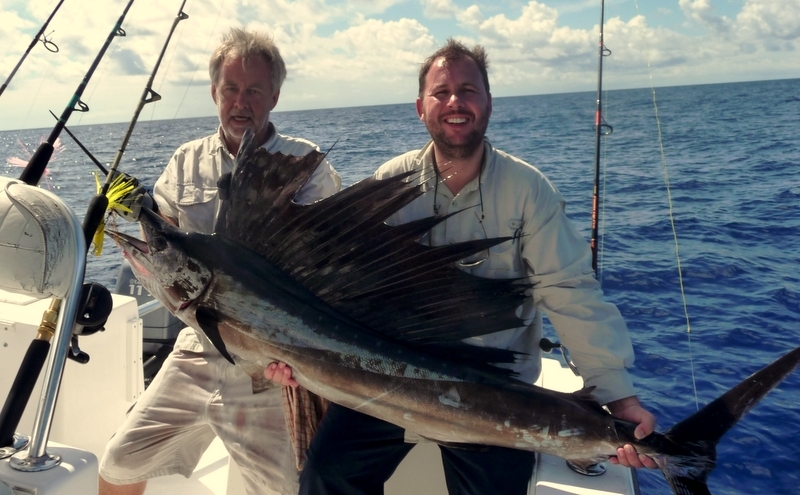 With the cold front has come the first push of our winter sailfish and double figure days are happening just up the Islands at Islamorada so we should be next. 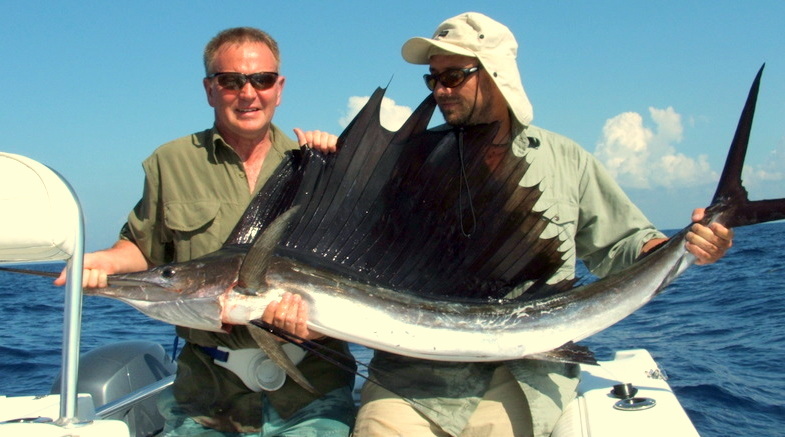 Here at Fish the Dream fishing holidays I have to admit we have over the years not had many sailfish the main reason is that Brits just don’t like trolling and that is how most sails are caught. 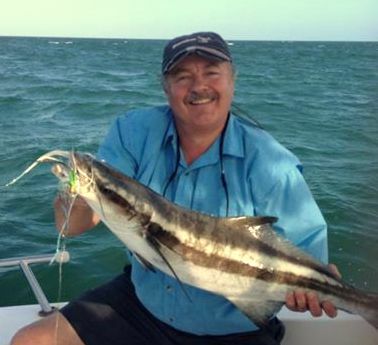 Also at this time of year the bay is loaded with all the mackerel’s with stunning shark behing and the wreck’s full of grouper so most day’s offshore trolling just does not happen. 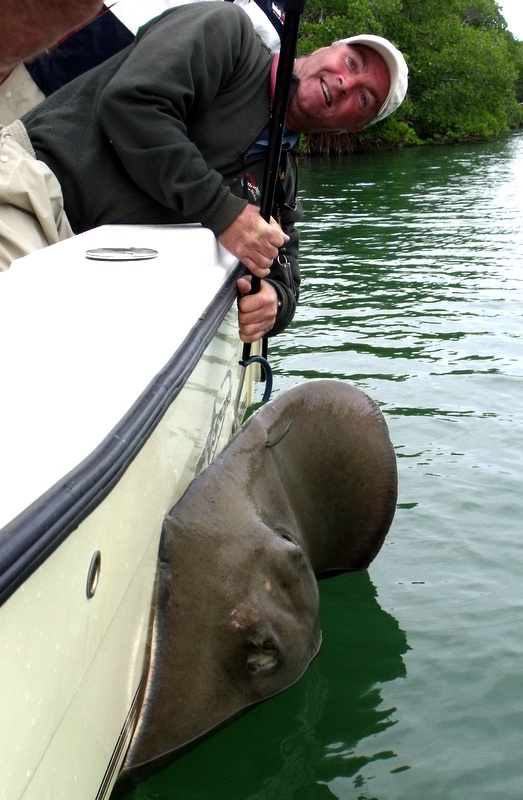 Normally in less than an hour with out a bite its ” please can we go back in the bay for the macs ” so as it is always the anglers who call the shots off we go. Next week things might change and I have two guys who want to tick the sail fish box so watch this space. Hot on the heels of their Small Game reel the guys up in Virginia have come out with its big brother the Large Game and what a beauty it is. 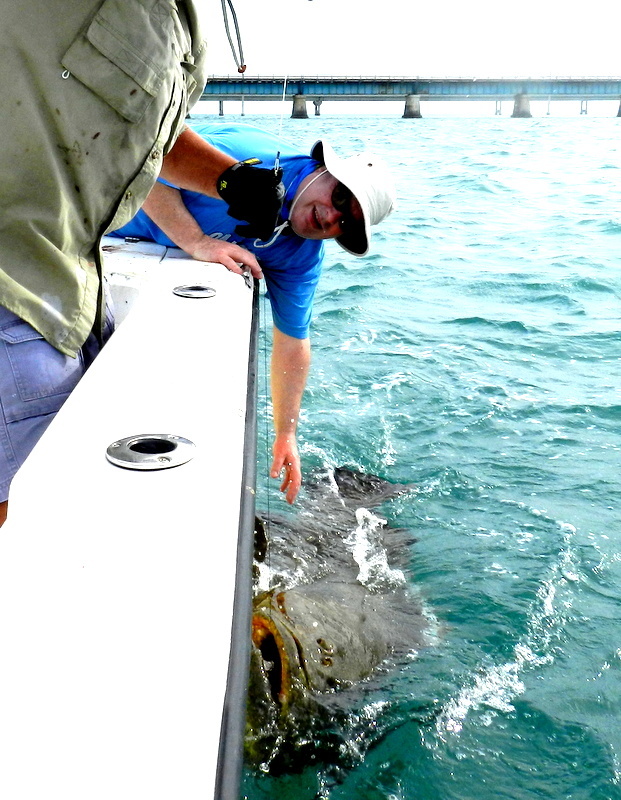 They sent one down to me to see my thoughts and to put some serious fish on the end of it for some real fish testing and here in the Florida Keys not a problem. So I loaded it with 65 lb Tuf line then off into Florida Bay to meet up with my tackle testing team you guessed it my beloved shark. 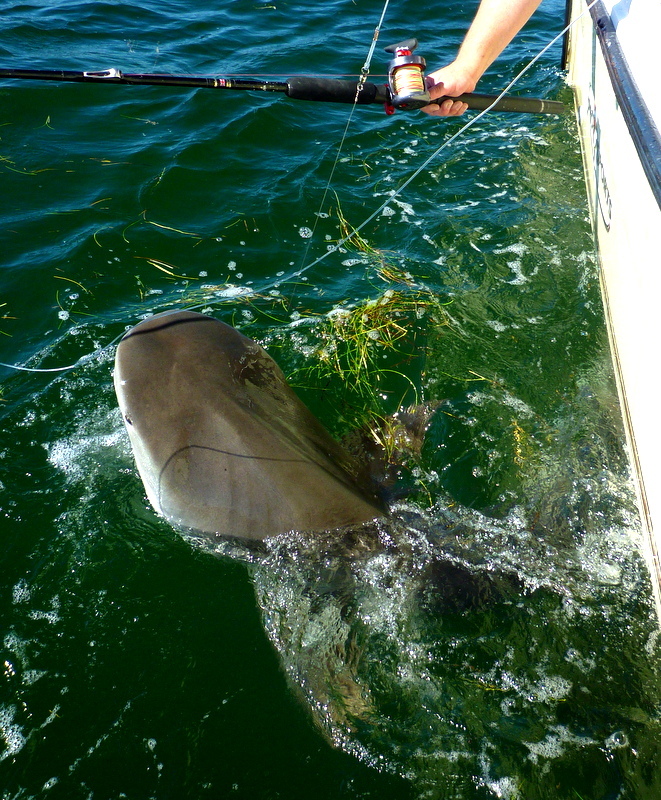 In no time at all one very angry tiger shark well over 300 lb was putting this reel to a very serious test indeed and in less than an hour we had the fish boat side to get the photos they wanted at Release Reels. The power from the long handle and oversize gears made this very easy also Release have used a reverse gearbox making cranking a lot easier and the whole out fit a lot more stable. 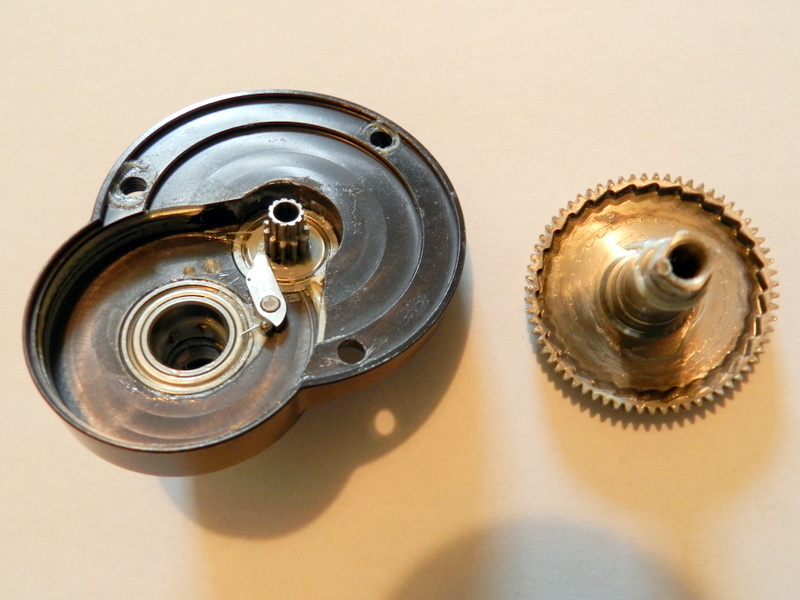 What do they mean by reverse gearbox, have a look at the photos of the Release and an Accurate you will see the gears are behind the spool line on the Release but in front on the Accurate very clever and it does make a difference. 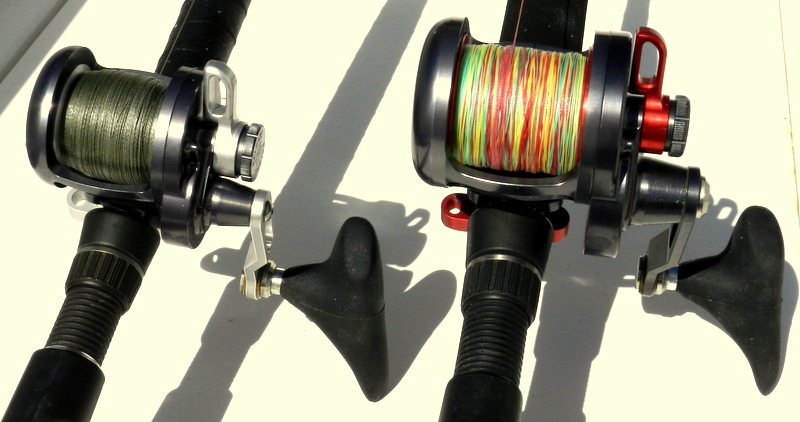 So just how big is the Large Game well line capacity has gone from 500 yds of 50 lb on the Small Game to 700 of 60 lb and the drag is now over 40 lbs, in the UK if you are into conger or serious shark and like to take your reel on holiday ( it only weighs 21 oz ) then you need to look at this reel. You must also remember it is 100 % designed, machined and assembled in Virginia USA and carries their lifetime warranty. The way Wes the CEO designed the new patent pending anti reverse still blows me away and all the other makers still must be thinking why oh why did we not think about that first. 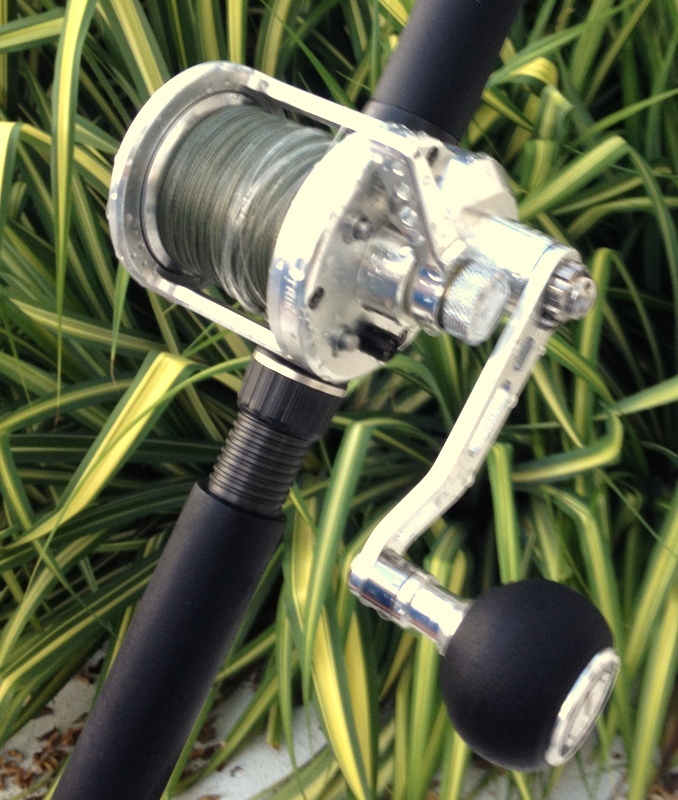 So if you are over here on a fishing holiday in the Florida Keys with me you will have a choice of Release reels to use and you will also be amazed by that strange-looking handle that once in your hand just works so well as does the rest of the reel. In the UK all Release reel sales are being handled by Snowbee UK ltd who are also looking after their lifetime warranty in the UK with no need to ship the reel back to the US. What a week the boys from Snowbee have had weather wise mixed to say the least, the first two days as calm as I have ever seen glass in the bay on our gulf wrecks then the same nearly 30 miles offshore on the tuna grounds. Boxes were being ticked as fast as any party I have ever had and Russell was over the moon with his products he was testing in the world of real fish, last out here then you know you have a winner. 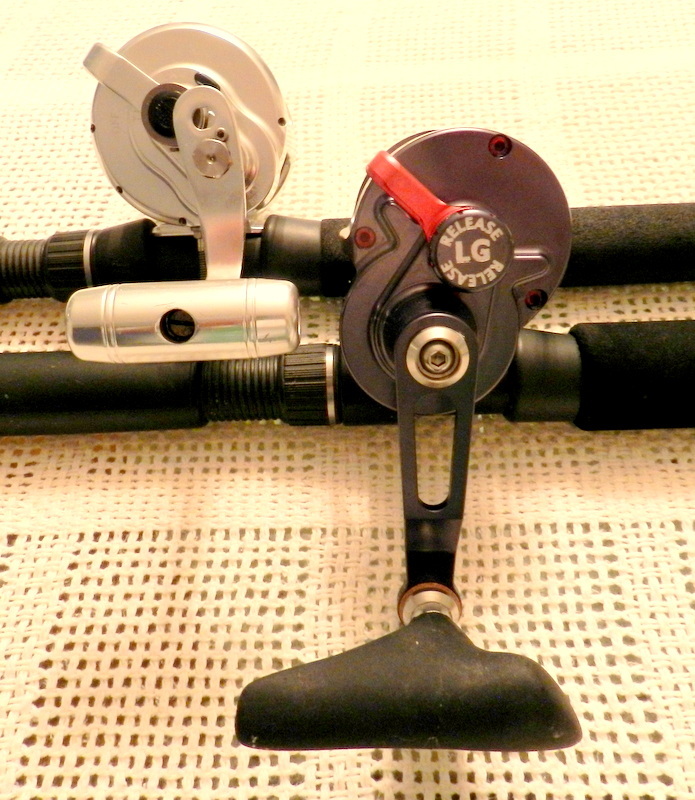 Both the new Deep Blue multiplier and the Kuroshio spinning reels were the stars of show I will let you know when both are on the market. Then the weather gods decided we were having it to easy so the wind started to blow and I mean blow up to 30 mph yes we can still fish but for fly fishermen nearly a no go and I felt for Russell who had a day on a flats boat to try for bone fish in all fairness no chance also felt for their guide. So the last day came round as is normal all to quickly when you are on a fishing holiday in the Florida Keys and the winds had dropped a bit and it was just ok in the bay and the guys just wanted to get back on the wrecks. First stop was a bank some 5 miles from the best wreck but I knew this bank would take the worst of the seas down and normally has so good fish and bait so a good first stop. 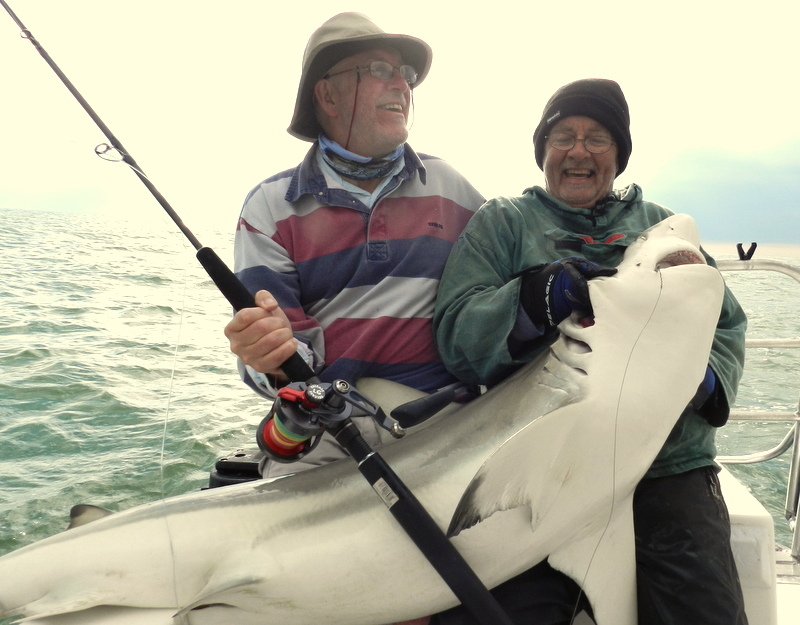 Russell had a fine near 100 lb black tip and was more than impressed with my spiral guide rod I would love to get this rod into production it just works so well and with some help from Snowbee it might happen. 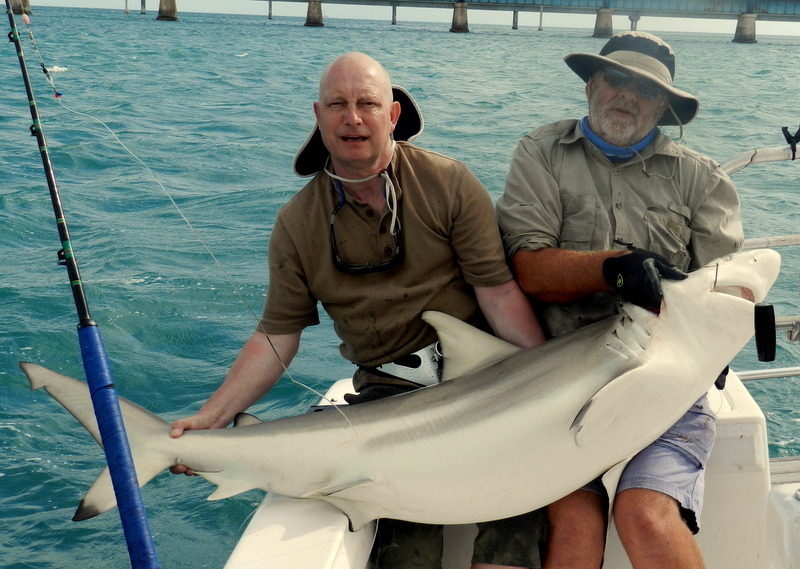 Then I had a very hard fighting lemon shark in the 200 lb range on a medium spinning rods while trying to get grouper for tea, always fun a big fish on a small rod. Then we finished up on two wrecks where we all had fun, Russell even ticked the box cobia on fly and even I was surprised how aggressive the take was and I had a stunning jack on a 15 lb line at one stage nearly 100 yds out from the hook up. I hope you have been watching this week on Snowbee uk ltd face book page as Russell said on his last post ” awesome last day and we will be back ” any time boys blast fishing with you. 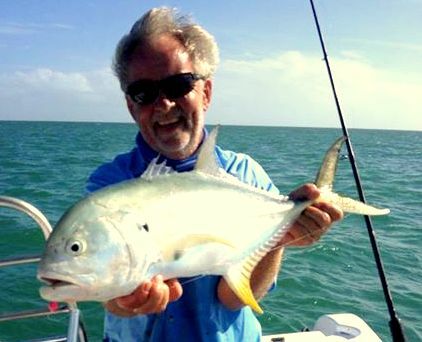 I had a message yesterday from one of my regulars who comes every year on a fishing holiday in the Florida Keys asking if I was OK he has been keeping up with Snowbee’s trip on their facebook page where Russell had posted to windy to fish. My friend had checked out the wind and said you have taken us out in winds like that and we have had great days fishing, what Russell ment to say to windy for FLY fishing. Over the years we have had a few fly fishing parties and yes strong winds are a problem but if you want to fish bait or lures wind no problem. This is the beauty of the Florida Keys you can always get out of the worst of the wind, we have mangroves, banks, and bridges that give enough shelter for lots of plan B’s. 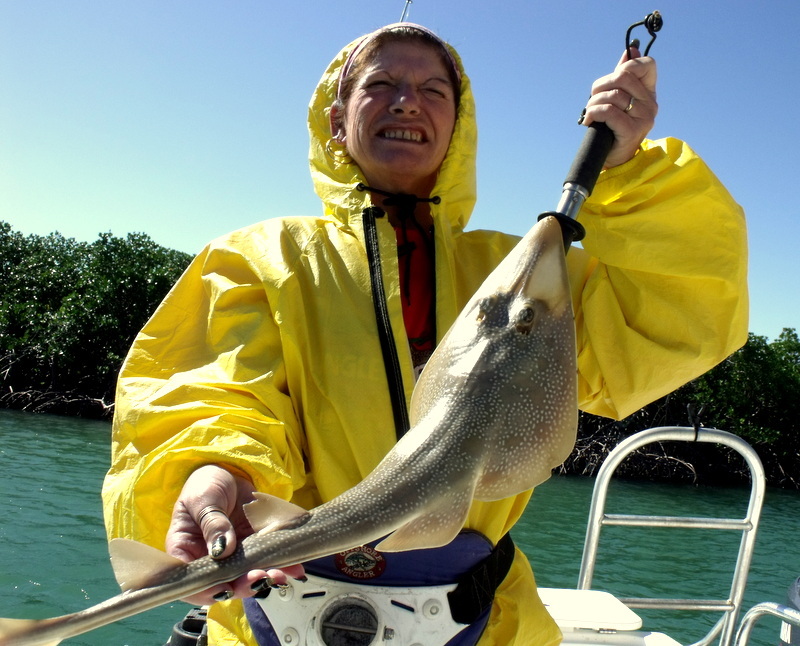 So what will you catch it these areas well you will be surprised some very big fish will often go into theses places to feed, the other year regular Brian had a stingray well over 100 lb in a very narrow mangrove channel and on the same trip Leslie had a fine guitar fish. As the bridges link to vast areas of water all fish have to swim through them to go from one to an other so have a good bait in the right spot and you will catch. Again a few years ago we had a huge blacktip shark that was full with pups that would have smashed the record of just 152 lbs but no way were we going to kill her. Also a lot of predators like to live at the bridges as all the bait is forced trough on the tides and we have had grouper over 300 lbs just feet from the piles. So don’t worry about the wind if you are up for it I will take you fishing every day it might not be pretty and not our plan A but I will put a bend in your rod ! For the last few years I have been lucky enough to work with Snowbee ( UK ) to help develop tackle for the US market and give them some real fish testing of their products. This week we have MD Russell Weston and his good friend Russell Symons out here to give some of their new products a testing that they will never get in the UK in other words if it works out here then it is more than OK for the UK. 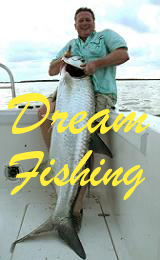 Russell also wanted to tick very big fish of his personal list no problem for Fish the Dream just how big do you want . First day was a bluebird day glass seas and nice and warm so of to the barracuda wreck to test Snowbee’s new range of Kuroshio rods using microwave rings which I first used last year and was more than impressed giving nearly 20 % more casting and calming wind knots. 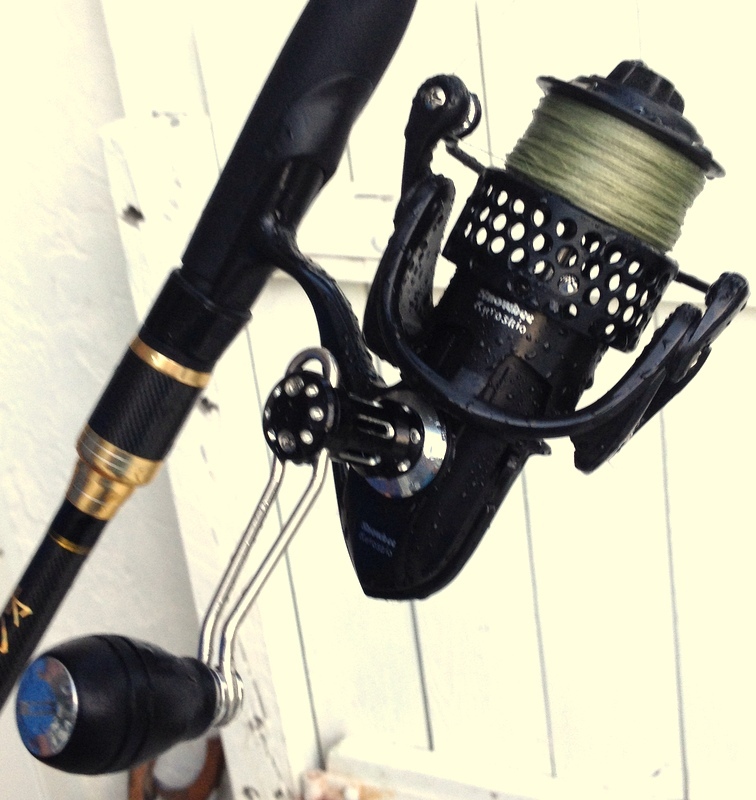 Also Russell wanted to test out the new range of Kuroshio spinning reels that will be sold to match the rods and they look and feel just fantastic. So all on a high but just 2 miles from the wreck our hearts sunk boat on our chosen spot c*** so as I have learnt doing fishing holidays in the Florida Keys for over 10 years just wait as is often the case here if they are not filling the cool box they leave, so pick down a mile away and watch. 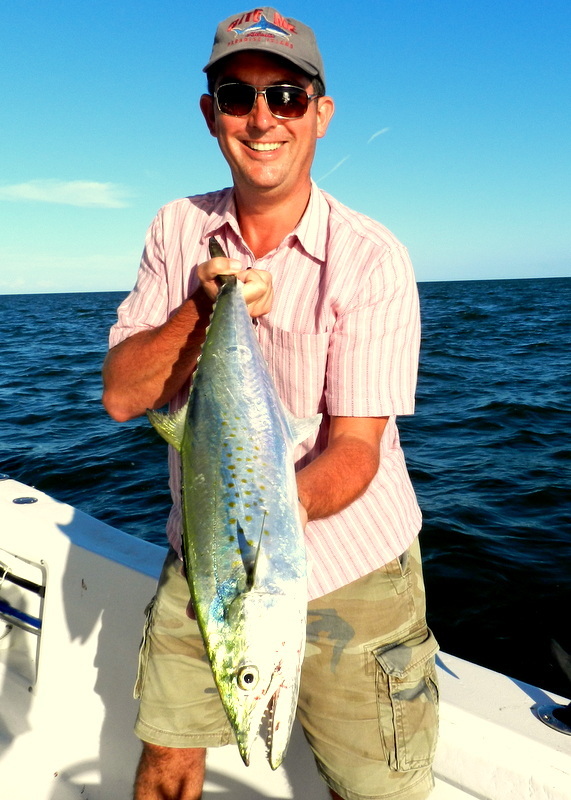 The plan worked and in less than half an hour the boat moved and we were on it as fast as possible and in no time tackle testing barracuda all round the boat. In no time it was fish on and the Kuroshiro had the test of its life and passed with flying colours one very happy Russell Weston. Now did he ask me about big well this wreck also has goliath grouper so a smallish bait down, oh dear a not very small fish had the bait and there was no stopping this one straight back to the wreck but we waited it out and Russell had a fish over 300 lb by the side of the boat, what a stunning day one. 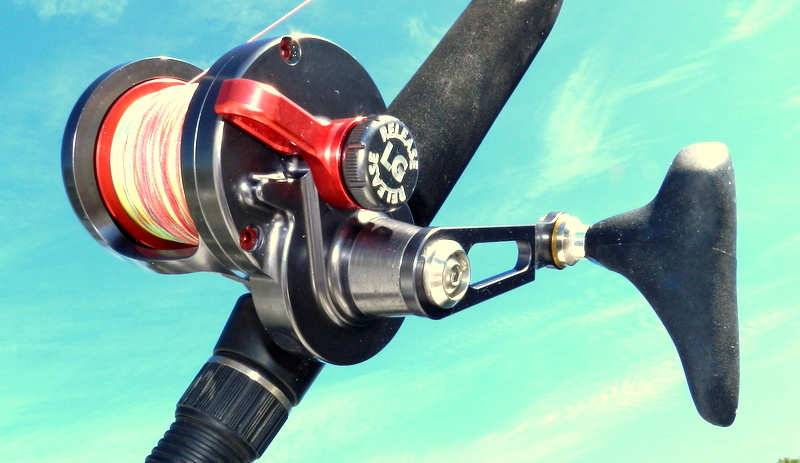 Day two again the weather good enough to go to the tuna grounds and there would be no better place to test the new Deep Blue 2 multiplier now with a bigger drag, improved bearings and a much better handle. 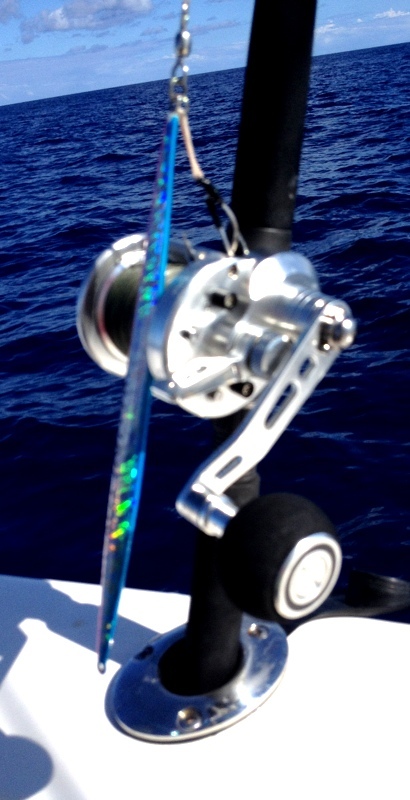 With again flat seas the 20 odd miles passed in no time and it was first or second drop fish on and pound for pound nothing fights like a tuna the new reel was just killing them and I must say the Snowbee jigs were fishing better than any jig I have seen. 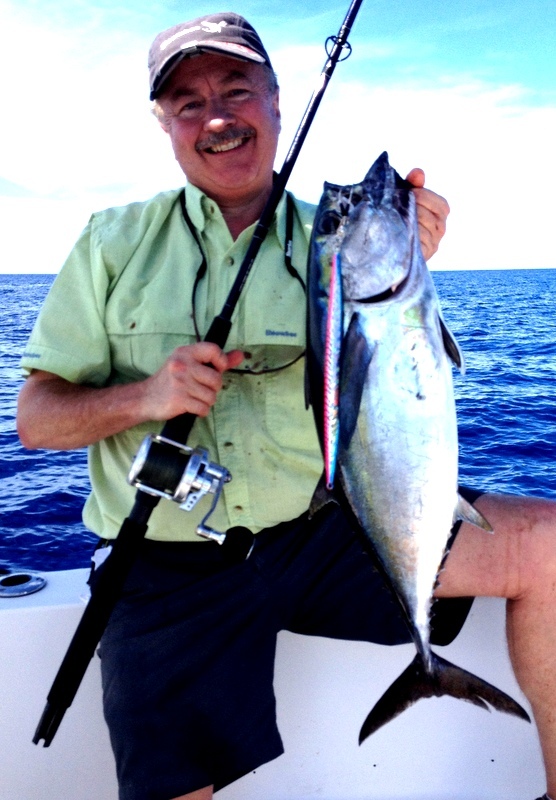 In less than two hours we had more than enough tuna for us and friends so with two very tired but happy anglers and one new reel that passed the test so well back for a cold beer and some seared tuna for diner does it get any better.